Search Expanse is an extension that can be downloaded from searchexpanse.com. This official installer is not compatible with any other browsers but Google Chrome extension; however, our research team warns that other installers could exist. This extension is also available from the Chrome web store (chrome.google.com/webstore/detail/search-expanse/iplldpoommgfmnpkaligpcldijmnjagk), and the information provided via the download page indicates that it is a new app. There are no reviews, and the user count is still quite low. Furthermore, it is stated that the 1.0.0 version was released only a few weeks ago. Our researchers believe that this program has not reached its full potential yet, and it is likely to be upgraded in the future. Hopefully, you will remove Search Expanse before its gets an update, and you can learn why this is important by reading this report. Our research has revealed that Search Expanse belongs to the big and scary family of SuperWeb adware. In the past, the ad-supported programs associated with this family were quite annoying and misleading, but the new version of this adware is much more suspicious. Tide Search and Search Adventure are few of the many new ad-supported programs that are identical to Search Expanse, and all of them are associated with browser hijackers, such as Nt.tidesearch.net and Nt.searchadventure.net. As you can tell by the names of these hijackers, they serve specific adware. Although Nt.searchexpanse.com is not active yet, it is very likely that this search tool will be released with the updated version of the ad-supported program we are discussing. At the moment, users are provided with a search tool via the extension, and the search queries entered into this tool are automatically redirected to Yahoo Search (search.yahoo.com). Is this suspicious? It certainly is. The Chrome extension controls your startup page, your homepage, and your search provider. If you move to the Settings menu, you will find that you cannot modify any of these search tools unless you disable the extension. Although you might want to do that, keep in mind that disabling it is not the same as removing it. The thing is that this extension does not modify your search results. Instead, it hijacks them using an extension that is also set up to open via the New Tab page every time you launch your Google Chrome browser. Even though it is obvious that Search Expanse is quite aggressive, computer users do not rush its removal because it looks normal. This search tool provides a search box, a weather forecast, date, time, and background images that you can change whenever you want. Yes, this add-on does not look malicious, but that does not mean that it can be trusted. The simple instructions below will help you uninstall unwanted applications and delete unwanted extensions, but we cannot guarantee that this will be enough to erase every single component of this suspicious adware. Because different versions of this threat exist and because they can be updated in an unpredictable way, we strongly recommend implementing a reliable malware scanner afterward to check if your PC is clean. Note that other threats could have slithered in as well if you have used third-party downloaders, which is another reason to use this scanner. If threats are detected, and you do not know how to erase them, use anti-malware software. Also, use this software if you want to keep your PC guarded in the future. Click the Start menu icon on the Taskbar and open the Control Panel menu. Double-click the Add or Remove Programs icon. 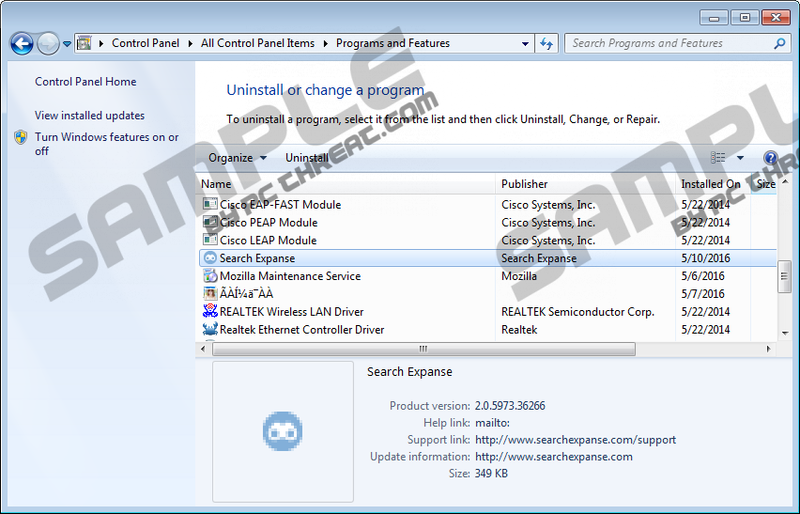 Move to the Programs (or Programs and Features) menu and click Uninstall a program. Right-click the unwanted program and choose Uninstall. Launch Google Chrome and tap Alt+F to access the Chrome menu. Choose More tools and click Extensions to access the list of active add-ons. Click the trash bin button next to the unwanted add-on and choose Remove. Launch Mozilla Firefox and tap Ctrl+Shift+A to access the Add-ons Manager. In the menu on the left click Extensions to access the list of active add-ons. Click the Remove button next to the unwanted add-on. Quick & tested solution for Search Expanse removal.